Solzon Corporation partners with the industries’ best manufacturers to help customers more accurately track, manage, and deploy critical assets. Solzon offers the broadest, most durable array of on demand barcode label and card printers designed for data collection industry. Printers for every application and environment including portable, desktop and high-performance table top. Label printers to be carried, mounted onto a forklift, or connected to a desktop and asked to produce thousands of labels a day. Wired or wireless, receipt or label, for a pallet, box or wrist, Solzon sells and supports a label printer for every application and every environment, however harsh. 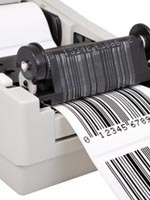 Barcode printers are an essential component in the auto id chain and Solzon Corporation boasts a line of printers with a wide range of capabilities. Solzon will help select the right printer for your data collection application and combine it with the proper label media and any applicable accessories. A Solzon printer solution will insure you’re tracking and managing products, transactions, and people for the maximum efficiency. Let Solzon provide the proper printer hardware, label and asset management application to best manage your operation and its capital.